Smartphone users are experiencing app fatigue and will migrate towards something else as soon as they find it. Well, in the coming months, chat bots and SMS will be what they’re looking for. Now that chat bots and SMS interfaces are maturing, the focus among industry players and their customers is enhancing user experience (UX). Thankfully, improving UX in these communication mediums is far easier and more flexible than it is with clunky mobile apps. Mobile apps were great. They had their run. But their time in the spotlight is fading fast. In 2011, 63 percent of apps were paid downloads, selling for an average of right around $3.64. By last year, that number shrunk to 27 percent, with an average price of just $1.27. But it’s not just paid apps that are drying up. It’s all apps – free versions included. According to one report, the average smartphone user downloads zero apps per month. That’s a pretty loud wake-up call for companies still investing resources into app development and marketing. Consumers are getting bored with apps. They don’t provide enough value and most customers feel as if the experiences they receive aren’t worth their time and effort. But there’s more to it. 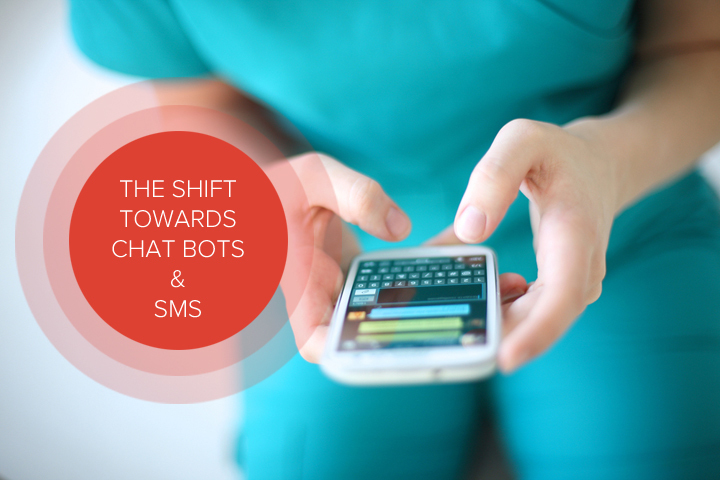 In searching for something that is an order of magnitude better than their predecessor, many brands are turning their attention towards chat bots and SMS – mobile communication channels that are far more progressive and engaging. Mobile apps just feel uncomfortable. They take time to load, require some tweaking, take up space on mobile devices, and have to be updated on a regular basis. All of these factors weigh down the overall UX and make it slower. The real potential for chat bots and SMS is speed and fluidity. Modern smartphone users want easy experiences. They’ve gotten glimpses of simplicity but want it from start to finish. Mobile apps have never been able to do this. If chat bots can, then they already gain the upper hand. More attractive. Finally, aesthetic appeal is a major desire. This is one thing many apps were able to nail, but the key for chat bots is to create attractive experiences without compromising speed and simplicity. Faster, easier, and more attractive – if you can do these three things, then chat bot and SMS UX will blow apps out of the water. You should develop a bot that meets your users’ needs – not just your own. So why would you develop a bot in a boardroom without any input from customers? In order to perfect the UX, you should capture various persona groups and use them to shape your strategy. From a customer’s perspective, there’s nothing worse than using a chat bot to ask a question and not being understood by the bot. One of the biggest points of friction comes when people ask complex or two-part questions. Furthermore, bots need to be prepared to answer situational questions, feedback, and even insults. Chan discusses all of these in more detail, noting that the smarter your bot is, the more repeat use it’ll get. You may feel an urge to spruce things up a bit by making your chat bot look or feel a certain way, but the most important thing you can do is keeping things simple. Users aren’t looking for some incredible experience that engages all of their senses. They want an informational and responsive tool that works. With this in mind, one thing you’ll have to decide on is whether you want/need to preserve chat history in individual conversations. One the one hand, customers may like it as it allows them to review previous exchanges. On the other hand, it could take away from the focus. This is just something to think about. We’re currently at a significant pivot point in terms of mobile communications and how smartphone users prefer to engage with their favorite brands. While mobile apps are still alive, they won’t be for long. Smartphone users are experiencing app fatigue and will migrate towards something else as soon as they find it. Well, in the coming months, chat bots and SMS will be what they’re looking for. At OpenMarket, we are considered the premier SMS messaging provider. We work with some of the largest enterprises in the world to enable powerful two-way messaging and engagement between brands and their customers. If you’re looking to move from stale mobile apps to fresh SMS, contact us today. We’d love to put you on the right track!